Home|Blogging|How to get healthy, long hair! How to get healthy, long hair! Isn’t it every girls dream to have long, luscious locks! I am still attempting to reach my hair goals & have had a few set backs with having 2 kiddiwinkles! Having a baby really seems to affect my mane & I have suffered quite baldy badly with post partum hair loss. I’ve tried everything from not brushing it… yes really to leave in conditioners, ‘gentle’ hair brushes & hair growth shampoo… all with no noticed improvements on hair length, quality or regrowth! However….for the last 6 months I have been taking Gold Crush natural hair vitamins, they are specially formulated to help boost the amount of good nutrients within our bodies to feed follicles, which in turn results in super healthy glossy hair! I have found that they have mainly targeted my bald patches, yes, seriously I had lots of bald patches – I haven’t yet noticed a huge change in the length of my hair but I guess now that the bald patches are no more I will begin to see a difference! Don’t worry I will keep you posted on good old Insta as I have a hair growth T-shirt to track my growth how FUN!! I have also been using raw organic coconut oil on my hair and every other inch of my body as it smells so damn good once a week as as a leave in conditioner & most days I run a small amount through the tips as my hair to act as a smoothing serum, I think this coupled with the hair vits has made such a difference! The vitamins are also great for skin & nails so really are worth investing in if you need a bit of a boost especially after this miserable weather we’ve been having! There are many different types of hair vitamins but I really have found these have made a huge difference to my locks! 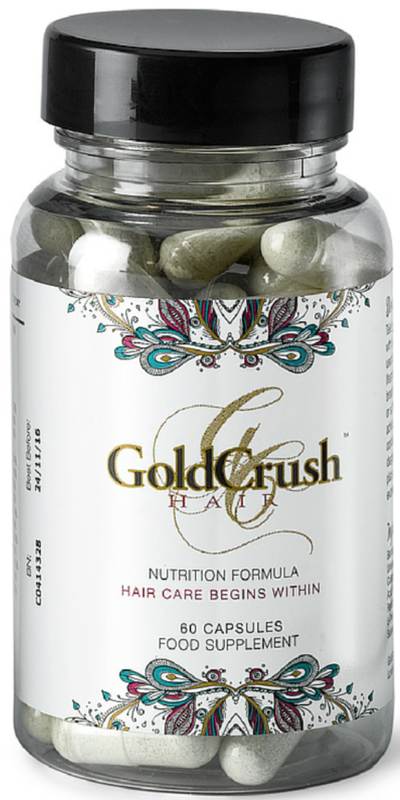 click here for the Gold Crush hair vits.